If you think you have spotted OPM you should firstly report any sightings to the Forestry Commission using their Tree Alert tool available from www.forestry.gov.uk/treealert or by email to opm@forestry.gsi.gov.uk. They can then keep track of the outbreak. Secondly, please do not try to remove the caterpillars or nests yourself. They need to be removed by an Arborist who has had the correct training and has the necessary equipment require. The nests must also be disposed of properly to avoid the pest spreading. 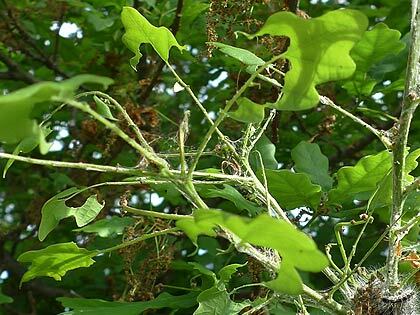 Any type of defoliating insect can have a serious impact on tree health, and OPM is no exception. Large populations of OPM caterpillars can completely strip the leaves from a tree. Loss of leaves is unsightly and also reduces photosynthesis, thereby reducing the energy a tree has to grow. In a weakened state, the tree will be more susceptible to other pests, disease, and environmental conditions. OPM caterpillars pose a serious health risk to people and animals. Hairs on the larger caterpillars contain a defensive toxin called thaumetopoein that is potentially harmful to humans and animals. The backs of older caterpillars may be covered with over 60,000 of these defensive bristles. Contact with the hairs, or their inhalation, can result in skin rashes, conjunctivitis and respiratory problems such as pharyngitis and asthma. Health problems can occur even if the larvae are not handled as the hairs break off readily and are dispersed in air currents. Caterpillars and nests should not be approached or handled in any way. Even abandoned nests should be treated with caution as they frequently contain vast numbers of detached hairs. Health problems presented by the presence of OPM are magnified since these pests are often found in urban trees. In these populated areas, repeat exposure is more likely. This is a particular issue since the hairs are sensitising and each subsequent reaction by an individual will be more severe. As recommended by the Forestry Commission, removal of these pests should be handled only by a reputable pest control expert. Information for this web site researched and written by Dr. Glynn Percival, manager of Bartlett's Tree Research and Diagnostic Laboratory at the University of Reading UK.